Home » OvationTix Blog » Want to Increase Donations at Your Live Events Organization? Here's How! Donations are a key revenue driver for many live events organizations. Does your development team want to increase individual giving? If your answer is yes, you've come to the right place. To illustrate the importance of donor support, according to TCG Theatre Facts, contributed income accounted for 43% of total income for the average theatre in 2017. As such, you want to leave no stone unturned when it comes to increasing donations and do everything you can to increase your fundraising dollars. Here are four tips to help you do just that. While there are a number of tactics that you can use to increase donations - like auctions, raffles, etc. - you need to set yourself up so that fundraising is a streamlined process in your business. First, you'll want to create fundraising campaigns for different projects and set goals. 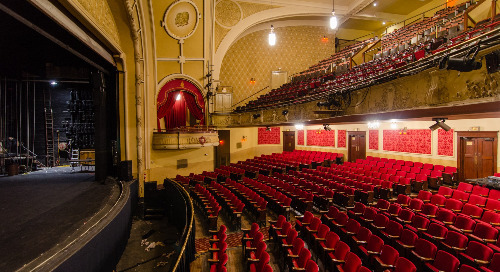 For example, you may have a stage restoration project that requires a certain amount of funding. By setting a goal for this campaign, you give yourself a target to work towards and can give your donors updates on your progress towards that goal. You'll also want to make it easy to collect donations. In OvationTix, ticket buyers can add donations to their cart during the purchase process. They can also select the campaign to which their donation will be directed and choose to give a fixed or custom amount. This donation cross-sell tactic is particularly important because people who buy tickets online make higher donations than those who buy from the box office or over the phone. By allowing supporters to make recurring donations, you can increase retention and revenue. Donors will often provide ongoing support if they can enter their credit card information in a 'set-it-and-forget-it' fashion. This eliminates the need for your development staff to chase donors at each renewal period. Additionally, this type of sustained giving allows donors to give small amounts over an extended period of time - say $10 per month - and opens you to a larger pool of long-term micro-donors who are perhaps unable to make large lump sum contributions. By setting these things up, you'll make it easier for your organization to collect donations, allowing you to build a sustained flow of contributed income over time. People donate to your organization because they believe in what you do. They believe your work has a positive impact on the community and want to see you thrive. So, connect people to your mission. Make them feel like they are part of what you are doing and you will see greater donor retention in the long term. One tactic is to send progress updates on projects they are helping fund. For example, if they made a donation to that stage restoration project we discussed earlier, send updates over time so they can see how their dollars are being sent. Little gestures can also go a long way. For instance, sending a handwritten thank you note for a donation makes supporters feel special and can be done at very little cost to your business. Another idea is to give your donors special privileges like access to exclusive dress rehearsals, thank you events, etc. By putting on these events and allowing donors to connect with one another, you give them the opportunity to share their passion for your mission while making them feel appreciated. Another way to reward your donors is to offer benefits at certain giving levels. Sun Valley Center for the Arts, an OvationTix client, offers automatic discounts to donors who make a yearly contribution of $50 or more. In live events, you want to move your first-time ticket buyers to loyal patrons and donors over time. TRG Arts does an excellent job of illustrating this process with their graphic below. A first-time ticket buyer is not going to become a long-term donor of your organization right away. However, by moving them through the stages as shown above, you can upgrade them to long-term donors over time. It's also important to make sure you are segmenting your asks by these stages in your fundraising campaigns. For example, a first-time ticket buyer may be much more amenable to making a $10 donation while a long-term subscriber may be more willing to make a $100 donation. Your database is a good place to find new donors. If you have patrons who have attended five or more events, but have not yet made a donation to your organization (a good database will help you identify these folks), you may want to send them a direct mail piece or add them to an email campaign to encourage them to contribute. In OvationTix, you can use our tagging and segmentation tools to identify donors, subscribers, board members and more. You can then use this data to create lists for targeted outreach in your fundraising campaigns. A donor relationship is one that you need to nurture over time. These people are an integral part of your community, and they require proper attention. However, it can be difficult to keep track of so many different people. So, how can you ensure that you are staying on top of everything and giving your donors the attention they deserve? The answer is a robust CRM. By utilizing CRM tools, you can automate a great deal of the heavy lifting, keep track of your activity and ensure you are following through on your fundraising efforts. One thing you'll want to do is automate your donation acknowledgement emails so that donors always get a thank you note when they make a contribution. In OvationTix, you can automate donation acknowledgement emails and even customize the email based on giving level. For example, you may want to describe the perks that a $5,000 donor receives and put that custom language in the emails for these donors. It's also a good idea to assign tasks for certain donors. As an example, for your $5,000-level donors, you may want to have your fundraising director call to say 'thank-you' and invite them to an appreciation event. In OvationTix, you can pull a list of all $5,000 donors and batch-assign a task for your fundraising director to call them. Another popular fundraising feature in OvationTix is the ability to give soft credits for donations. You may have board members who are responsible for bringing in a certain amount of donations throughout the year on top of their individual contributions. By applying soft credits to donations that they bring in, you can give them proper credit for doing so. By implementing the tactics listed above, you'll be able to create robust fundraising programs that are sure to engage donors, increase donations and keep donors giving to your organization for the long term. If you need any help getting started, don't hesitate to schedule a demo of OvationTix and we'll show you how to get it done!